For some couples, the most expensive day of their life will be when they tie the knot, with around 35%1 of newlyweds blowing their wedding budget before they even walk down the aisle. With the average Aussie wedding costing $36,200, and more than half of that money going toward food, drinks and the venue2, we check out some ways you could potentially minimise your spend. 1. Talk about money early with your partner and families (that is, if they’re going to be involved). Decide what you’ll be able to pay for, and if your family is helping with expenses, to what extent. 2. Start saving early. Make a list of what you want, put a limit on what you hope to spend and try to find a balance in between. Remember, on top of the venue, you may be looking to put money toward things such as wedding attire, photography, decorations and entertainment. 3. Book in advance. Try to book the venue for your ceremony, reception and honeymoon well in advance to potentially avoid disappointment, or being forced into a last-minute, more expensive option. 4. Grab a bargain. Search eBay or Gumtree, or hunt down end-of-stock bargains, such as DIY wedding stationery, pre-loved decorations or even a wedding dress. 5. Have an out-of-season wedding. Be different! 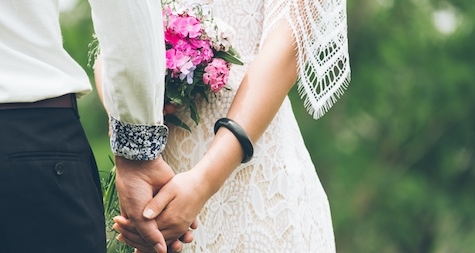 Have a July wedding to cut costs without sacrificing your precious memories. Many venues and suppliers have lower-priced deals during the winter. 6. Be realistic with your guest list. If you haven’t been in contact with friends in the last 12 months, why do it now? And, remember to lay down the law with the family, so you don’t end up with tables full of relatives you’ve never met! 7. Explore your network. Call on talented friends who can swap a service for a gift, such as a photographer, a hair stylist or make-up artist. Maybe someone knows a band that can play at the reception too. 8. Cut the ties. Times are changing and so are weddings. It’s ok to shed some traditions. Be practical about whether you need all the trimmings, like a videographer, bonbonnieres, gifts for parents or even the bridal party, if you need to cut costs. 9. Adopt informality. Swap a formal sit-down dinner for a cocktail party and save on room hire and catering costs. Or, if the venue allows it, organise the drinks yourself. 10. Pay attention to the fine print. Read your suppliers’ contracts, even if they are long and complicated. Don’t get caught out by any extra charges which are sometimes in the fine print. 11. Wishing well. If you’re already living together, chances are that you have most of what you need, with a wishing well often providing a polite way to ask for money. You can then use this to pay for the honeymoon or pay off some of the wedding expenses. If you haven’t already, review your finances and make sure you give yourself enough time to save for the wedding you want. If you need help with your savings goals, please contact us on 02 4342 1888 we can assist you on staying on track financially so you can relax and enjoy the celebrations, knowing that declaring your love doesn’t have to come at a price you cannot afford.